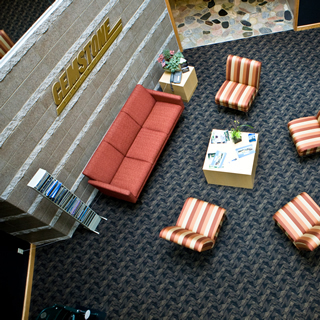 Tom Becken owns the Center Pointe Professional Building, a high end office space in Mendota Heights. Tom’s company Cemstone Corporation is headquartered there and he typically has six to eight additional tenants. Cemstone’s brand image reflects the innovative diversity of the concrete products Cemstone offers, which Tom has helped make the standard of the concrete industry. His flooring needs required attractive, contemporary, high-quality products that reinforced his company’s cutting-edge position in new applications of concrete. Products for Tom’s tenant areas needed to fit both his high-quality standards and build-out budget. His installation expectations included timely service and perfect workmanship. For this project, Tom wanted carpet for his lobby that had the same striking level-loop pattern that had been installed in his office by another vendor. This presented a challenge, as the previous vendor’s installation included pattern mismatches that remained even after corrective follow-ups. Design and product selection: CBL reviewed the carpet selection with Cemstone and the installation difficulties inherent in the product choice, but assured him that CBL’s installers could do the difficult task with ease. Installation: CBL operations manager and our commercial crews made sure the work was done on time and met Tom’s high standards.